How many of you stick to the same time old tried and tested products and formulations, believing it’s better the devil you know than the beauty stuff you don’t? Once we discover something we can supposedly rely on, it’s tricky to get into the mindset of regularly changing it up or trying something new – even if we know the grass may be greener on the other side. I’ve spoken previously about the new anti-perspirant formulas from Dove that have been re-formulated to be their most skin friendly ever; they’ve re-balanced the formulations to provide even more moisturisation for this often sensitive part of your body, and the range now features ingredients that are more commonly found within luxury skin care products. All this on top of Dove’s signature 1/4 moisturising cream that its deodorants are so well known for. This reformulation allows the range to lubricate the skin and ensure it’s working effectively, alongside aiding the repair of damaged skin after hair removal. These hardworking features ensure that the Dove anti-perspirants are superior to many other household names I’ve tried, providing a comfortable and effective experience. But how many of you regularly change up your deodorant or seek out something that offers more than just basic protection? 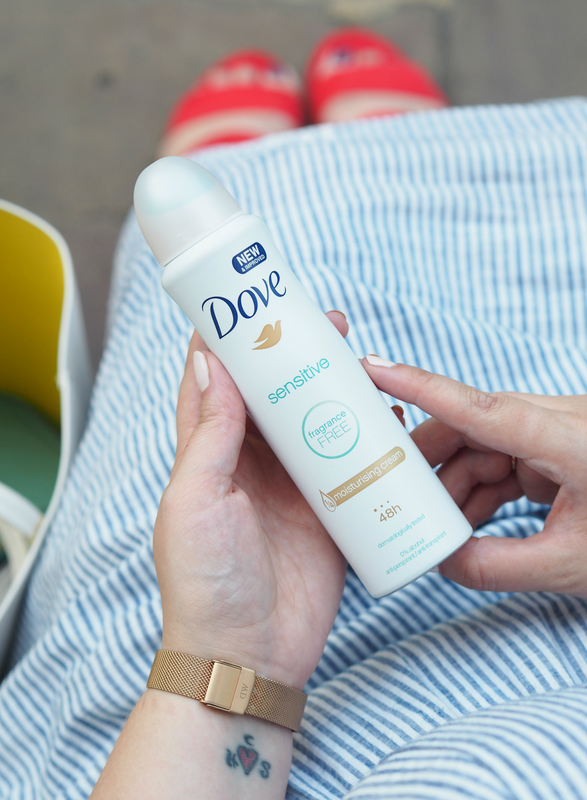 I’m really sensitive to scents and textures, so Dove has been a brand I’ve long been using. I love the original version of their anti-perspirant as I can rely on it to keep me dry, without worrying that the texture it leaves on skin will irritate or the smell will overload my senses. My underarms feel really soft and comfortable. I normally use the Dove shower products but I’d not used the anti-perspirants before. In this heatwave it kept me totally dry and fresh, which I was impressed with considering I usually used roll-ons and swapped for the spray. I noticed my underarms were definitely softer after trying it for a week – in fact I pH tested and the moisture levels in my armpits raised from 19% to 36% in only seven days! Usually I stick with the rollerball I’ve used for many years. More for the routine and peace of mind than for the protection I suppose. I really enjoyed this, particularly the scent which was really refreshing. It didn’t sting or feel uncomfortable at all, but instead felt pleasant on the skin. weeks ago. The pomegranate version smells sooooo nice, without being overpowering. I can apply it straight after shaving with no stinging whatsoever (even the spray version) and it really does make your underarms so smooth! I’ve just introduced my nine year old daughter to Dove as her first foray into deodorant, as it’s a brand I know I can trust to be delicate on her skin. 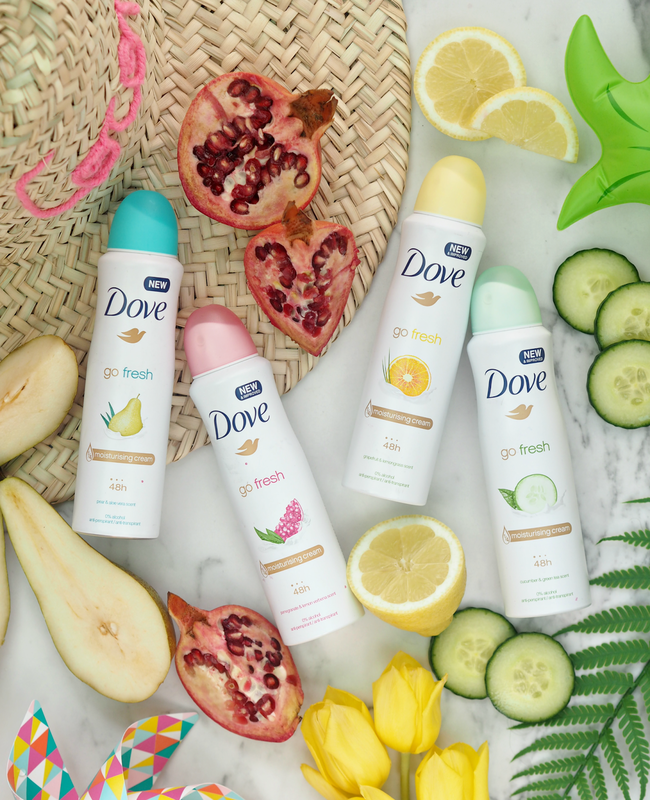 Dove’s antiperspirants were for women who glowed – and that’s not me! the fragrance is a bonus: it’s so delicate and pretty. I’ve used Dove for many years and often flit between the classic scent and new additions. I first saw this in New York last year and was probably a touch too excited about it, so I was delighted to see it being launched in the UK. The fragrance of pear is so uplifting and comforting, especially during the summer months, which when combined with aloe provides me a morning hit of freshness that keeps me confident and dry all day long. My pits are always nourished and don’t ever get sore – which is all I can ask for from my antiperspirant! 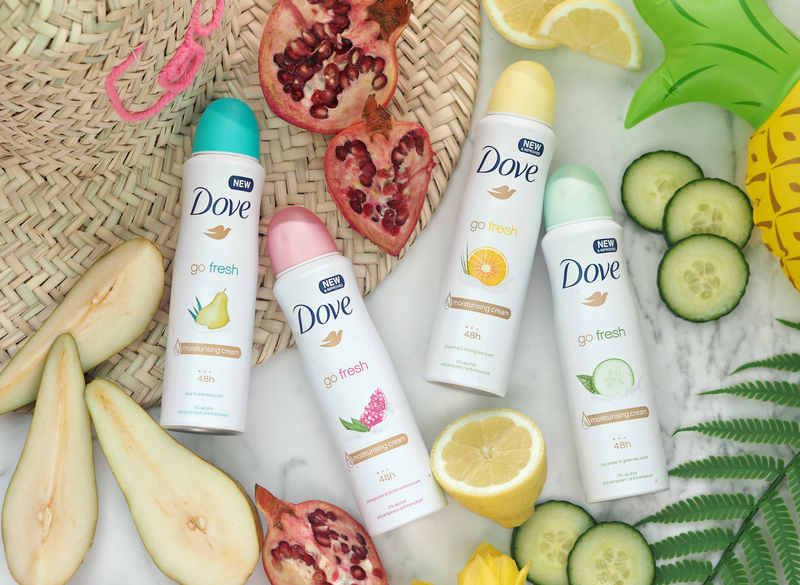 Seven variants and seven correspondingly positively glowing testimonials; proof that switching up your usual deodorant for a touch of Dove could give your underarms the care and attention they need. Our underarms are so often neglected, and can be a part of our body we’re not always so confident in revealing, but treating them with the care and attention they deserve will have you lifting your arms with pride! Whether you shave them, pluck them, decorate them, cover them, reveal them or leave them in their natural state, treat them well because they work hard every single day. Why not pick up your favourite and see what difference it could make to you in just a week? Read my previous post all about the new Dove antiperspirant range here, and why we shouldn’t be treating our underarms differently to other areas of our body here. Don’t forget to enter our competition to WIN a £250 high street shopping voucher and entire range of Dove antiperspirants too! Thanks Candice! And it's been my personal choice for a long time. Yeah it's interesting that that's been the perception of everyone I've spoken to/has tried it! I was really interested that my mate gave it to her young daughter too, as a brand she really trusted. I love the photos, more amazing shot from you! I do stick to Sure as I have used it for years. The times I have tried a new one, it's been awful and felt sticky and horrible resulting in throwing it away, such a waste. Dove does sound like a good one though and I think it will give it a go.